Good Smile Company (celebrating 15 years in business this year; happy birthday, chaps!) has unveiled its new 1/7 scale Hatsune Miku figure. This one is of Snow Miku, and she is impossibly beautiful. For those that aren't aware of the story; Crypton, the folks that invented Miku, are based up in snowy Sapporo in Japan. Being the city of the winter festival there is a tradition where, every year, Crypton invites fans to design a winter costume for Miku, and the best one is picked to be the "official" Snow Miku every year. 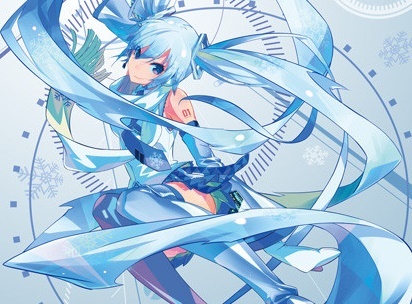 And, consequently, Snow Miku has become quite popular. And that means the figures from the various companies have been popular, too. However, one thing that is common to the Snow Miku figures is that they tend to belong to the Nendoriod or figma series, neither of which I'm a big fan of. No, I'm quite into the scale figures, and there's not too many of them about for the Snow Miku line, which is why I am so, so keen on this one. There's a 'trailer' below. Have a look and try telling me that isn't the most beautiful use of plastic in the history of mankind.